Couples in healthy, sustainable Integral Love Relationships co-create a sustainable and peaceful future for all humanity. Supporting singles and couples in co-creating healthy, sustainable Integral (Evolutionary) Love Relationships that provide the greatest good for the largest number of people. We do this through this website, www.integralsingles.com, free newsletters, books, online events, talks, workshops, trainings, and coaching. Integral couples share a higher purpose and co-create, heal, learn, grow and awaken at all levels of their being (material, physical, sexual, emotional, intellectual, spiritual) in intimate, passionate and committed love relationships. The individual interior subjective/experiential “I” or mind. The individual exterior objective/material “it” or form/body. 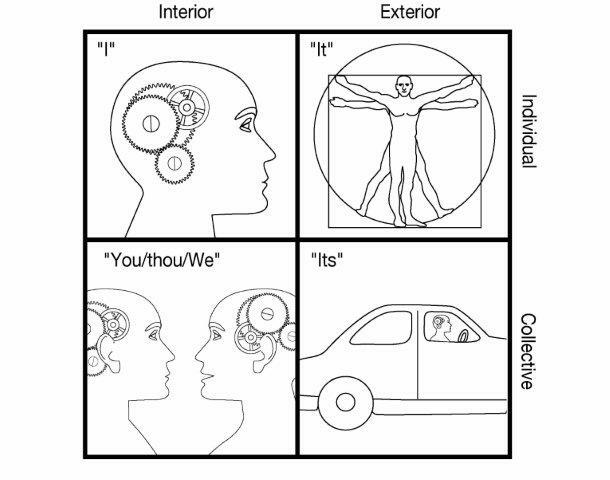 The collective interior inter-subjective “we” or shared values/culture. The collective exterior inter-objective “its” social environment. 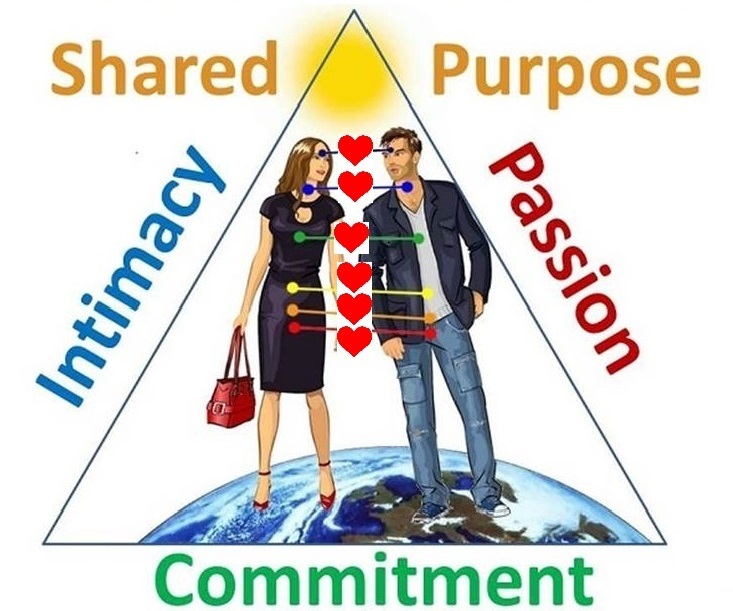 These four dimensions are shown as four quadrants on the right and are combined into the metaphorical triangle of love. Integral couples co-create and love each other in all these four dimensions at all levels of their being and those that they will develop and grow into in the future. 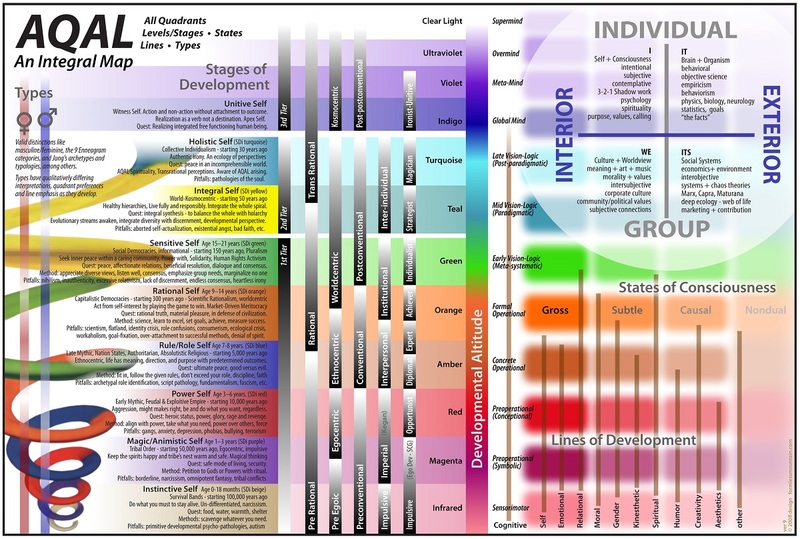 Eight levels of consciousness development from Archaic to Transpersonal as shown on the left side of the graphic on the right (click here for more). Balancing and harmonizing healthy feminine and masculine polarities as show by the two lines next to it (more). 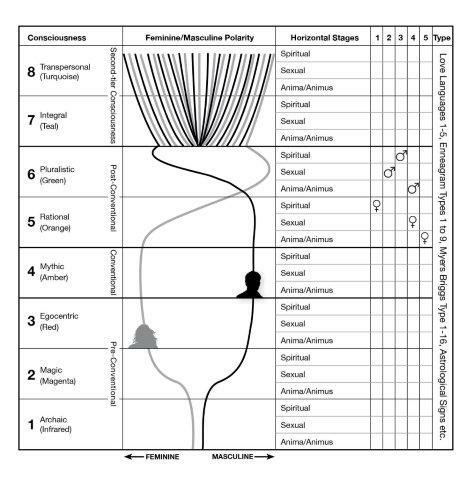 Five Horizontal stages of spiritual, sexual and anima/animus complex development as indicated by the five little boxes for each level of consciousness. Personality types such as Love Languages and Ennegram or Meyers Briggs types. Integral Relationships: A Manual for Men provides a clear road-map for this ongoing healing, growth and developmental process. Being integrally informed allows men (and curious women) to reduce their suffering by meeting their partner at his or her level of development and to co-create healthy, sustainable love relationships through ongoing learning, healing, growing and awakening to provide the greatest good for the largest number of people. Below is another image that shows the Integral Map. Click on the image for larger view.